Toshiba and Sony are in negotiations to combine their LCD operations into a new joint venture which would overtake Sharp in LCD panel market share. The companies are hoping to have an agreement this month, and form the new entity later this year. 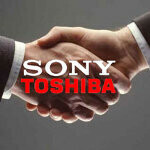 Once created, Toshiba and Sony may sell as much as an 80% stake in the new venture to the Japanese government. Nikkei business daily reported that Innovation Network Corp., an investment fund backed by the Japanese government, invest about 100 billion yen ($1.24 billion USD) in the Toshiba/Sony entity, which could be equivalent to an 80% share in the company. Nikkei also speculated that this money would be used to invest in OEL (organic electroluminescence) panel (also known as OLED) production at the Sony plant in the Aichi prefecture. OEL panels offer higher resolutions than LCD at lower power consumption, but have been known to not perform as well in direct sunlight. "but have been known to not perform as well in direct sunlight." that was with OLED panels of yesterday.